2017 Cannes Best Actor winner and 3-time Oscar nominated actor Joaquin Phoenix has agreed to play legendary comic book villain The Joker in Warner Bros/DC’s standalone origins film set to be directed by The Hangover and Due Date director Todd Phillips. 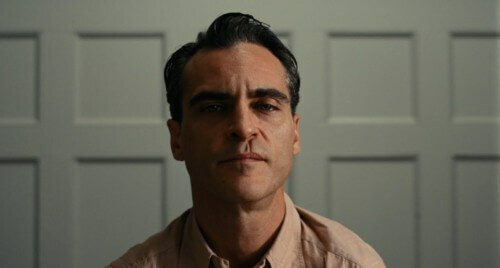 Joaquin Phoenix in ‘The Master’ (2012). According to Variety, Phoenix has long been Phillips’ first choice for the role and has recently agreed to take the part, though an official contract has yet to be signed. Early rumours suggested that Leonardo DiCaprio was the studio’s first choice for the part courtesy of the actor’s close ties to the coming film’s producer Martin Scorsese, the man whom directed DiCaprio in the likes of The Departed, Shutter Island and The Wolf of Wall Street. Eventual choice Phoenix was reportedly close to signing on to play Lex Luthor in Batman v Superman: Dawn of Justice – a role that eventually went to Jesse Eisenberg – and was rumoured for a part in Marvel Studios film Doctor Strange. The yet-to-be-titled Joker-centred film will be the first in DC/Warner Bros’ new line of standalone features aimed at putting the story in the hands of creators, with Phillips also set to co-write the film alongside Scott Silver (The Fighter – 2010). The movie, originally announced in August, looks likely to be set in the 1980s and will have no connection to the ongoing universe movies in which the character is played by Jared Leto. Leto will reportedly continue in the role as regards those projects.